Both samples of milk are from the same mother. The yellow milk represents the mother’s response to protecting her child from infection. Westmead Hospital’s Women’s and Newborn Health team has posted a breastfeeding fact that has taken the social media world by storm. Coinciding with an image of two bags of breast milk with differing colours, the post highlights the incredible power a mother’s body has to help her baby fight viruses. The post has been liked by more than 1,000 people and shared over 320 times. “Here’s an amazing fact about your breast milk,” the post shared. “Your breasts have receptors that can detect if your baby is unwell with a virus or bacteria. “The baby’s saliva is checked and then your body will actually change the immunological composition of the milk by producing customised antibodies to fight the infection. 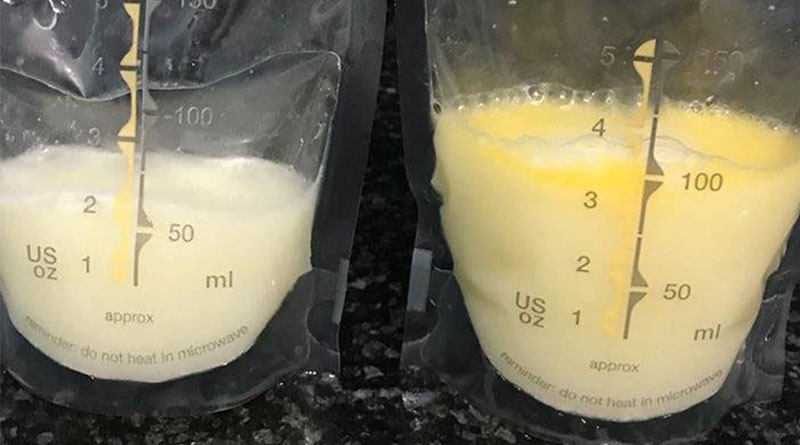 “One of our midwives who has a six month old baby girl shared this picture of what her breast milk looked like when her baby was well compared to when she had a fever. Thanks to our Women’s and Newborn Health team for revealing this incredible fact and highlighting how powerful a woman’s body is. You can follow Westmead Hospital’s caseload midwifery Facebook page here. To find out more about the Women’s and Newborn Health team visit their website here. To learn more about how breast milk protects infants against infections, you can read about the research here.